So the day has finally come. The next wedding I shoot will undoubtedly be the most personal for me (since I assume Marse wont let me shoot Lola’s) because its the wedding of one of my greatest friends in the world. I have the honor and challenge of being the bestmanphotographer. in a kilt. it doesn’t get any better than that. so applehead studio is packin up the entire crew and heading west to Okatoks, AB. Me, Marcia, Lola, +1 and BoBo the bear are headed on our first cross Canada adventure. A real live vacation in the summer (except I get to shoot a fun wedding too). Here’s a shot from last weeks wedding with Sarah + Ryan over in Dartmouth. This is what happens when you don’t make any plans for photos anywhere up until about 5 minutes before you find yourself slipping into a shopping cart and careening downhill. 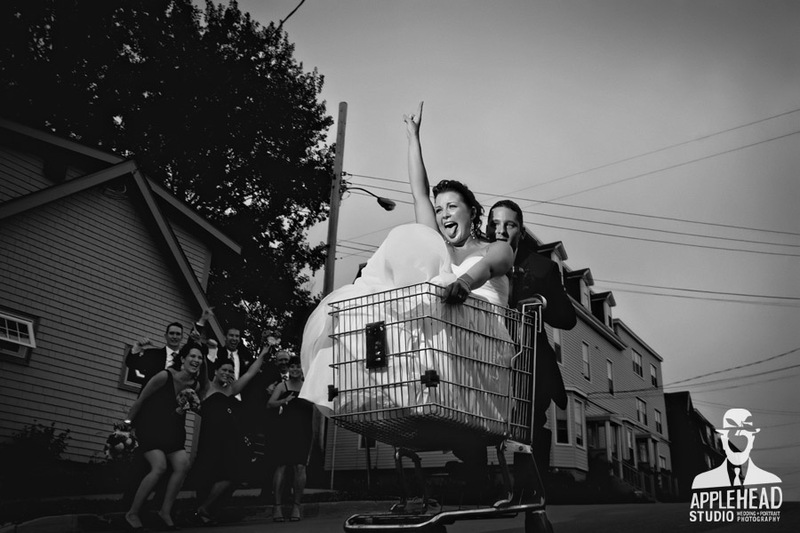 that might be one of the funnest weddings photos EVER! It just puts a big smile on your face! !